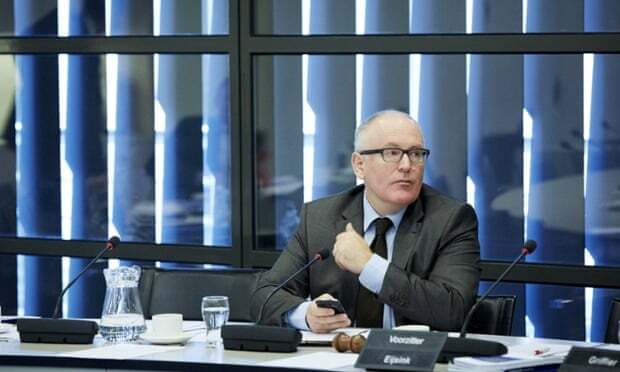 In a bid to prevent leaks, the EU’s powerful vice-president Frans Timmermans presented paper versions of the work plan proposals to the bloc’s commissioners on Wednesday, which were then collected afterwards, but copies have been seen by the Guardian. No final decision will be taken until another commissioners’ meeting before the plan’s launch next Tuesday. The EU president, Jean-Claude Juncker, will be keenly gauging reactions to today’s leak in the European parliament, where cross-party support for the proposals is strong. The draft communication divides legislative proposals into three groups – new initiatives, plans needing adjustment, and proposals to be withdrawn. One of those to be withdrawn is an ambitious circular economy directive which would phase out landfill dumping by 2025 and, by 2030, oblige EU states to recycle or reuse 70% of their waste, 80% of their product packaging, 90% of their paper (by 2025), with similar goals for plastics, wood, glass and metals.